There are a lot of career opportunities and personal branding opportunities hidden in plain sight, or just things people overlook or think are antiquated and unnecessary. One of the first things I do with FinePoint clients is evaluate what’s already out there about them, and obviously factors they might have completely forgotten about. There is the missed opportunity of your bio, but another one that is hiding in plain sight is the business card. A bit of history on the business card itself: They date back to the 17th century, when they were used to announce the arrival of a distinguished guest to the keepers of an estate. A networking event isn’t exactly the announcement of your arrival on horseback to have a conversation about startup culture, but a business card can work in your favor. People have mixed feelings about business cards. Some think they are silly, but I will tell you – they still matter. Some people throw them in the trash or have forgone them altogether, but it’s the most literal and physical representation of yourself these days (besides, you know, standing in front of someone.) Let’s dissect why. Let’s not take that the wrong way – whenever you meet someone you exchange a handshake and ideas. They can have takeaways from that – maybe they’ll want to be your client, or call on your for advice or camaraderie in the future. However, you’re usually not leaving them with anything at all. A card is a physical reminder of you – your business, personality and value. If it’s memorable, playful or visually appealing, that is a nod in your favor. Everyone meets a lot of people, and it’s important to be remembered. A personal website can show your personality in a way you can’t otherwise in business. The same goes for a business card. People notice nice paper stock or an interesting design. However, non-standard shaped business cards – circular, teeny tiny so you immediately lose them – are not suggested. People still have card holders, believe it or not. Mine is bedazzled. It works. I get a ton of remarks on my business cards (hello, Moo.com plug! 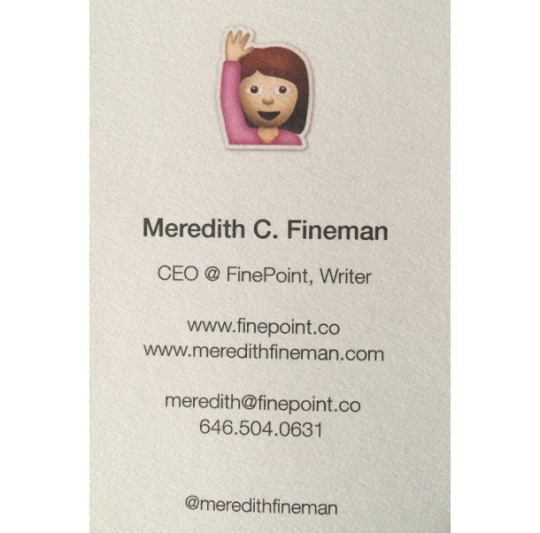 ), because of the weight of the cardstock, but mostly because I have an emoji on it. It might read a little too much for some, but it’s very memorable. You might be tempted to list everything on your card, but don’t overcrowd it. One email, one to two URLs (one, preferably) and one phone number. Add one simple message on the front. Otherwise, it’s sensory overload and someone will ignore most of it. My card has an emoji for personality, phone number, URL and email for convenience and the palm leaf on the front is purely aspirational of warm weather. I opted not to put “www" – they’re unnecessary at this point. Now put your cards on the table.